Have spent the morning so far tidying in anticipation of the Harrowers and Neises visiting tonight, I finally managed to get the Contrail pitched up and seam sealed. I’ve had it a month and still haven’t slept in it yet, going by the photo above need to work on my pitching skills too. May has been a write off for getting out into the hills, which is a shame as it’s the last month where you have a pretty good chance of avoiding midgies. It’s definitely warming up too, it’s a scorcher today [my thermometer at the front door thinks it’s 35C, it’s not that hot, I think I need a new one]. All I know is, it’s too hot for this particular Scotsman. It’s too hot to be up hills today, I can barely move around the garden without breaking into a sweat. I was wearing latex gloves whilst seam sealing the tent, I can’t really recommend it in this heat, they were like two bags of sweat by the time I’d finished and hands were like prunes. So you went for the Contrail, thats another one I considered, I’ll wait for your review with interest. Yeah, Hendrik tried to talk me into getting the Moment, but I wanted a camping experience quite different to the Akto I currently have. Something more open and airy for the warmer months. Time will tell how the Contrail copes with side winds, I managed to get this one on eBay for around £120. You’re not alone, I had my DuoMid for a month before I got around to seam sealing it! A long summer of enjoying it lies ahead now though (I hope!). I’ve had one of these for just over a year. I like it a lot. 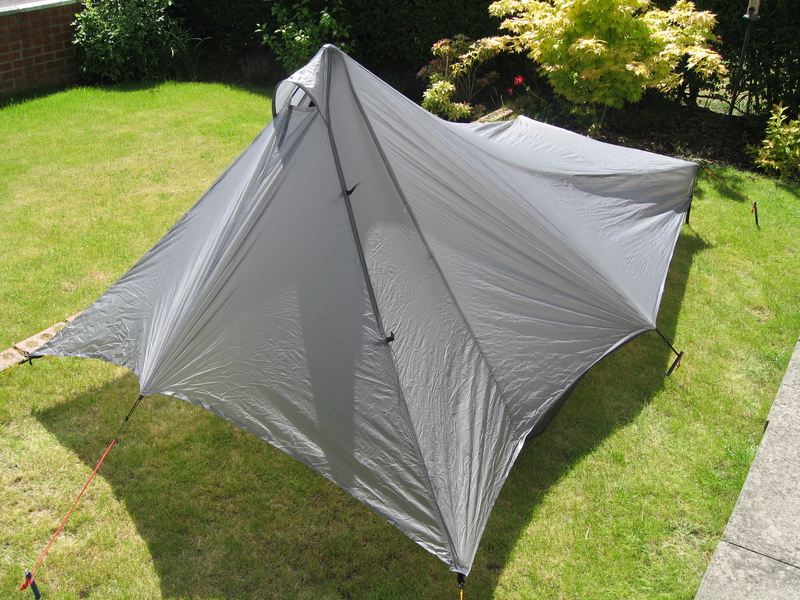 Never tried it on an exposed, windy pitch but for low level stuff, it’s great. I met Henry Shires on the recent tgo challenge.Thoroughly good egg, he was using a moment, saw about 5 tarptent tents used in all I think.